Borgo Panigale, Bologna, 15 March 2019 – The Days of Joy are back for a fourth edition, offering a series of events - riding courses, outdoor activities and pure relaxation - just perfect for those looking to explore the Ducati Scrambler world. 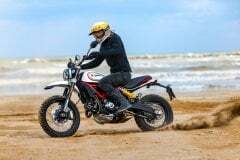 New for 2019, the Scrambler Experiences in Romagna and Tuscany offer two fascinating tours, genuine cuisine from the Italian Apennines and limitless fun. 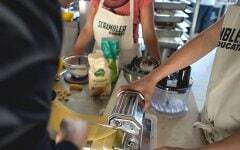 Participants in the Romagna Scrambler Experience will start off from Cesenatico on Saturday 6 April. This one-day tour over paved and dirt roads gives riders a great opportunity to appreciate the new Scrambler range. 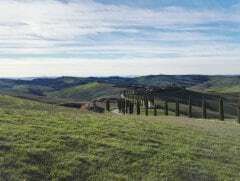 A mid-day checkpoint in the midst of the Tuscany-Romagna Apennines offers up the chance to taste the local cuisine in relaxed Land of Joy style, while the day will end with an awesome beach BBQ at Cesenatico. 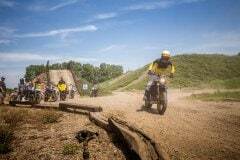 The Tuscany Scrambler Experience, instead, scheduled for the weekend of 6 - 7 July , takes participants on a two-day ride over the hills around Siena. This all-round on and off-road experience takes in over 200 km on the first day and more than 150 km on the second. It's pure riding pleasure, ridden over a route that takes in the Fattoria Pieve in Salti (Siena) where riders can enjoy genuine local food and the relaxed atmosphere that is the hallmark of every Land of Joy event. This experience has been put together in collaboration with the organising committee of the Eroica®classical bicycle race and takes in many of the same stunning roads. 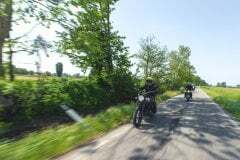 Offering a rewarding mix of fun and learning, the riding courses held at Vairano Country House, in the Pavia countryside not far from Milan, will take place on 2 June and 8 September. Flat Track School participants will learn how to drift around oval dirt tracks safely. Off Road School participants will learn how to handle Off Road Tracks on the Desert Sled. 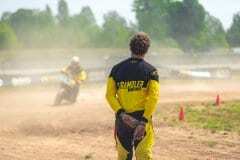 Scrambler Basic Riding School, instead, is for all aspiring motorcyclists looking to learn how to ride properly before they get their license. Days of Joy, though, also means countryside fun and relaxation. In other words, an all-American outdoor BBQ, a chill-out area with music, loungers and beach umbrellas, a pool table, the opportunity to try out the entire Ducati Scrambler range and a not-to-be-missed Cooking Class where a famous chef will teach participants how to barbecue like a pro. Tour coordination and all riding courses are managed by instructors from Due Ruote. Another new aspect of Days of Joy 2019 is that Pirelli will be taking part in the events, highlighting how the successful partnership between these two Italian excellences goes far beyond mere technical collaboration. All participants will receive a welcome kit with a Ducati Scrambler-branded gadget. For detailed info on costs and how to enrol for Days of Joy please visit the dedicated section on the website.